The movement to reform the criminal justice system is still dominated by men and politicians. 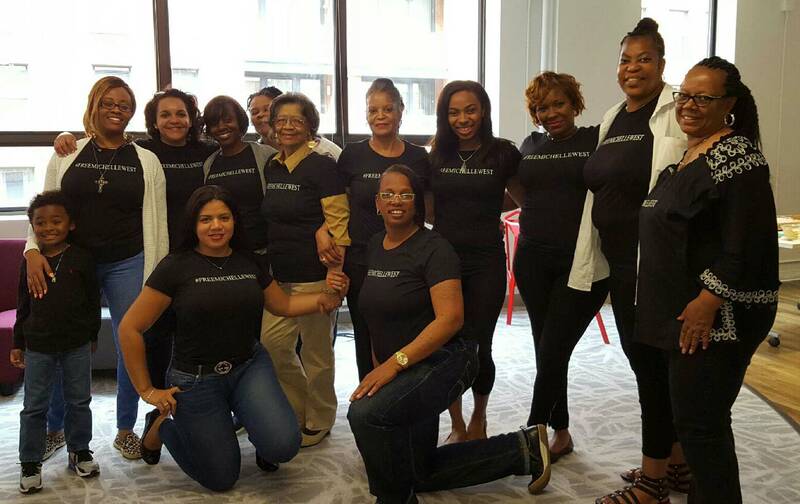 This group of incarcerated and formerly incarcerated women is changing that. Since her release from prison in 2011, James has been working non-stop to make that dorm-room vision come true. She wrote Upper Bunkies Unite, a book that is part memoir part manifesto, to connect her personal experiences to the decades of legislation fueling the explosion of women’s imprisonment. She started Families for Justice as Healing, a Boston-based organization that advocates reducing incarceration in a multitude of ways, from helping a woman fight draconian drug war charges to stopping the construction of a new jail. And she traveled around the country connecting with other formerly incarcerated women. Last December, James joined forces with some of these sister activists to form the country’s only national organization founded and run by women who have been—or still are—in the prison system. The organization is called the National Council for Incarcerated and Formerly Incarcerated Women and Girls, and its mission is twofold: to inject the “voices and expertise” of women who have been affected by incarceration into the conversation around policy, reform, organizing, and services; and to support the work that currently and formerly incarcerated women are already doing, often in isolation and with little encouragement. “The whole point of the Council is a sisterhood,” James explained. This sisterhood exists in state and federal prisons across the country, but there have been few avenues for women to recreate it once outside, which has hobbled their efforts. “The only way we’re going to have that kind of power and create policies that impact our lives and our communities is to create this network [of women],” she stated. While mass incarceration and the bloated criminal justice system have garnered increasing attention in recent years, the same cannot be said for the experiences of the country’s growing population of incarcerated women. Women’s prison issues, such as struggles to parent and maintain child custody, sexual assault, and reproductive health care have often been overlooked in larger discussions of prison reform. But even when their concerns—like inadequate health care, draconian sentencing, and aging behind bars—overlap with those of their male counterparts, women’s particular experiences continue to be ignored. James recalls often being the only formerly incarcerated woman at meetings and forums about criminal justice policy. Though she always added her voice and experience from her seat in the audience or during the question-and-answer period, she recalls that “being so vocal wasn’t met with open arms. That was a lonely time for me.” But she persisted, drawing strength from the support—and weekly letters—of the women she had left behind. To make sure they are heard, the members are not only bringing women’s voices to conferences and panels, but they’ve also organized their own public events about women’s incarceration. At these symposia, formerly incarcerated women are the experts on the panels; they are the ones who analyze the policies and realities fueling mass incarceration and they are the ones proposing the solutions. The Council has even managed to include the voices of women still behind bars at a number of events, by arranging for them to call in via cell phone or through the prison’s video visit technology. Andrea James recalls often being the only formerly incarcerated woman at forums about criminal justice policy. The Council’s members are also connecting across the country to share tactics and strategies to decrease the prison population. When James wanted to push alternatives to incarceration for primary caregivers of dependent children, she spent hours on the phone with Council members in California who had successfully passed similar legislation. “They shared what worked, what didn’t work, their strategies, their language,” James recalled. “What they gave me was a blueprint, a road map to help shape and flush this out.” Though the Massachusetts bill died in committee this past spring, James said that the support continually reminded her, “Every time you’re doing something, you don’t have to go at it alone.” And now, says James, women in Connecticut and Pennsylvania have expressed interest in pushing similar legislation in their states. On the national level, Council members are making sure that women are not forgotten in the push for presidential clemency. Individually and collectively, they’ve advocated for the release of women serving lengthy sentences for drug convictions, including, most recently, Danielle Metz. Metz had received a triple life sentence for drug conspiracy, but on August 30, James and other Council members rejoiced when Metz’s name was on the list of clemencies. Still, Council members know that much more needs to be done, especially in the last months of Obama’s administration. “We intend to use every opportunity—any moment that makes itself available—to advocate for these women,” James said. Nine months after its inaugural meeting, the Council’s efforts are already reaping results. According to James, the group has 500 members in 22 states—along with another 2,000 women who have agreed to respond to calls for action whenever mass mobilizations, such as calls to support pending bills or clemency for a particular person, are needed. At age 73, Phyllis Hardy is one of the oldest Council members. During her 23 and a half years in prison, she mentored and mothered countless younger women, most of whom affectionately call her Grandma. Now, whether she knew them behind bars or not, she counsels any girl or woman who needs support at the monthly meetings. Hardy might still be in prison if it weren’t for James and her tireless efforts. In 1991, Hardy, then 49, entered prison on a 366-month (or 30 years and six months) sentence. As she aged, her health and mobility declined. In 2011, the women imprisoned with her wrote a letter to Obama begging him to commute her sentence. They received no response. But James wasn’t taking no for an answer. Along with Hardy’s family, and women who had been mothered by Hardy in prison, James agitated, organized, and gathered hundreds of signatures demanding she be allowed to leave prison. In 2015, Hardy was granted compassionate release though, James noted, her health had deteriorated so much that she had a heart attack when she first learned the news. Today, Hardy is the de facto matriarch of the Council. Though her health does not allow her to fly, she hasn’t let that stop her from participating in the Council. Instead, her son drives her (and her husband Willy) from their home in North Carolina to the monthly meetings in various states. Other women had no previous connection to James. Teresa Hodge spent more than four and a half years in the federal prison camp in Alderson, West Virginia, where she and her daughter Laurin frequently talked about Hodge’s post-prison future. Those conversations made her realize that the resources she needed upon release are also needed by the thousands leaving prison each year. That was the start of Mission: Launch, a Washington, DC-based non-profit that combines reentry services with tech education to assist people returning home from prison in reintegrating into today’s fast-paced world. Hodge and her daughter established it in 2012. In August 2015, three months after she left prison, Topeka Sam traveled from her home in New York City to Harvard Law School to attend the Free Her conference, which James had organized to bring together formerly incarcerated women from across the country. There, Sam listened to women talk not only about their personal experiences, but also about their efforts to change the policies that had devastated their lives, families, and communities. The Council’s inaugural meeting was held in New York City last December. Since then, it has convened in a different city each month, always in spaces that work with formerly incarcerated women. 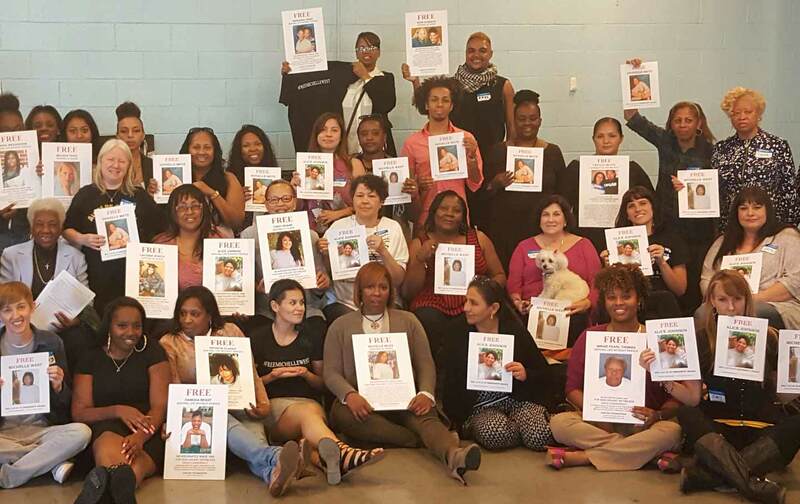 In February, over 100 women and gender non-conforming people from the east and west coasts convened at Chuco’s Justice Center in Inglewood, a black and Latino city in the greater Los Angeles area. Women who hadn’t seen each other in years hugged, cried, and took pictures together, often grouping themselves by prison, the way college alumni might group themselves by dorm. In Washington, DC, a similar excitement pulsed through the third weekend of April. On Friday morning, Phyllis Hardy hugged former political prisoner Susan Rosenberg, who had been granted clemency by then-President Bill Clinton hours before he left office in 2001; Hardy and Rosenberg had met in 1992 at the maximum-security unit at Marianna, Florida. Tiheba Bain saw her best friend Ramona Brant for the first time since Bain had left prison in 2011. Brant, who is one of the many drug-war prisoners that the Council had pushed to receive clemency, walked out of federal prison onto the sidewalks of Brooklyn in February of this year. Miquelle West comes to every Council meeting and event clad in a leather jacket, tight black pants, knee high boots and a shirt she designed herself that simply says “#FreeMichelleWest.” West was ten when her mother, Michelle, disappeared from her life; it was only years later that she learned that her mother had been arrested and sentenced to two life sentences plus an additional 50 years. Two months later, when the Council convened in DC, West met Kyndia Riley, a 19-year-old whose parents have been in prison since she was three years old. Like West, Riley has not had anyone who understands her experiences—until now. Riley grew up with her grandparents and older sister in the small town of Heastville, Virginia. For years, the girls’ grandparents said that their parents were “working with the government.” When Riley was eight, children on the school bus teased her, saying that she didn’t have a mother because her mother was in prison. “I was in school thinking about it all day,” she recalled. When she got home, she asked her grandmother, who finally told her the truth. Her parents had been given multiple life sentences for conspiracy to distribute cocaine. In high school, tragedy struck, not once, but three times. During her first year of high school, her grandfather died from liver cancer. Three years later, in January 2015, her sister died. In June of that year, she lost her grandmother, too. Riley graduated that June, the first in her family to finish high school. But no family member watched her walk to Pomp and Circumstance and receive her diploma. At a friend’s suggestion, she set up a GoFundMe page. Two days later, Humans of New York ran a photo and statement from her father, who is imprisoned in Allenwood, Pennsylvania. Though he didn’t mention her by name, he stated that his daughter was enrolled at UVA. Students and alumni found her GoFundMe page and began donating, enabling Riley to pay her tuition, bills and property taxes. Topeka Sam also saw the post and Riley’s GoFundMe. She sent a Facebook message inviting Riley to DC for the weekend’s events and gathering. The Council would pay for Riley’s train fare and hotel room. The Council not only provided the opportunity to speak, but also connected her with a community of women who understood her pain and had spent years with her mother, Santra Rucker. And it connected her with Miquelle West, who is showing her that she need not accept her mother’s permanent absence, that she can connect with others and fight to bring her mother home. The Council does not exclude women based on the nature of their conviction. While some, like Hardy and Brant, had non-violent drug convictions, others, like Rosenberg, had violent felonies. “We’re not separating violent and non-violent offenders,” said Topeka Sam. In fact, no one asks the reason behind a person’s incarceration. “When you’re in prison, you don’t run up to somebody and ask why they’re there,” explained Andrea James. “It’s never part of the conversation.” The same holds true with the Council. “We’re talking about people, and people are human beings and sometimes do things that cause harm,” said James. The Council’s refusal to exclude people based on their conviction has been refreshing to several women who have stated that, for the first time, they have not felt excluded because their convictions involved violence. Not even a year old, the Council is already pushing the voices of incarcerated women into criminal justice discussions. On March 30th, as part of the White House’s convening on women and the criminal justice system, James participated in a 45-minute armchair discussion with Valerie Jarrett, chair of the White House Council on Women and Girls. No outside expert interpreted her experience to fit their analyses on mass incarceration; she was the one to analyze her experiences and link them to current policies. James also brought several other formerly incarcerated women, including Topeka Sam and Phyllis Hardy, to the White House. Three weeks later, James was back in DC for a press conference introducing the Council to the world, and the next afternoon, three dozen formerly incarcerated women gathered in the Mission Launch office. Over coffee and bagels and, later, pizza and wraps, they shared experiences and strategies. As the hours passed, women disappeared to the bathroom to swap blouses for #FreeMichelleWest shirts. Some had never met Michelle West—or even heard her name before that weekend, but they pulled a shirt on just the same.